Moog Music has a history of announcing new products to coincide with its annual Moogfest celebrations, and the 2018 shebang was no exception. Mere days before this year's get-together, the company revealed a new semi-modular analogue synthesizer. It probably doesn’t need to be said that this is a company that knows a thing or two about modular synths. In the 1960s, Robert Moog's massive modular systems were the first commercially viable synthesisers, and in recent years the company has pitched its semi-modular Mother-32 and DFAM modules to the Eurorack and desktop crowds. 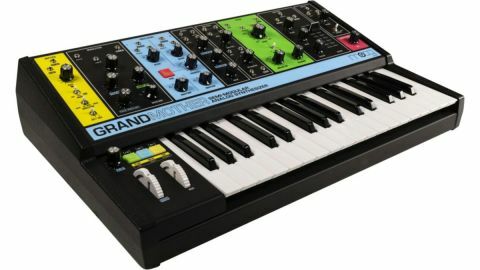 This new one - dubbed the Grandmother - is a first for Moog's semi-modular line in that it comes equipped with a high-quality, 32-note, velocity-sensitive keyboard courtesy of Fatar. There’s also a pair of wheels, one for pitchbend and another for modulation. The former is spring-loaded, allowing it to always return to the root note in play. A trio of colourful backlit buttons crowns the left-hand control section. These perform multiple duties, shifting octaves as well as acting as sequencer controls (Play, Hold, Tap tempo). They're also used when recording sequences. Additionally, these busy buttons (along with the similarly-styled Oscillator Sync button) provide access to many hidden functions, more on which a bit later. A Glide knob to their left provides the obligatory Emersonian pitch sweep. A legato mode is possible, accessed by pressing the Hold button and turning the knob. Like your mum's mum, this Grandmother is bedecked in the finest retro chic. The panel is divided into multi-coloured 'modules' that include Sequencer (yellow), Modulation (black), Oscillators (pale blue), Mixer and Utilities (both black), Filter (green), VCA (black) and Spring Reverb (red). Each offers the expected controls, along with a combined total of 35 1/8-inch (3.5mm) jacks that can be used for re-routing the internally wired signal path. The colour scheme has been the source of some division in synthesis circles. Yet to these eyes it offers both a hint of the machine's retro-centric sound as well as a means by which each section may be quickly identified - good for those just learning the ropes. Around back, there's an Audio section with a ¼-inch (unbalanced) output jack, a ¼-inch Instrument input for routing external signals through the filter and reverb, along with a 1/8-inch jack for Reverb output and another with the appropriate level for sending audio signals to Eurorack modules. There is an additional quartet of 1/8-inch jacks dedicated to interfacing the Grandmother's built-in sequencer/arpeggiator, including Clock in and out, Reset input, and On/Off input. Further connectivity comes in the form of DIN-style MIDI In, Out, and Thru, as well as USB MIDI. A red LED indicates incoming MIDI, thoughtfully placed between the MIDI Out and USB ports where you're least likely to see it! There's a tiny Fine Tune knob with a centre detente for adjusting the master tune of Oscillator 1, a power switch and a jack for the external power supply's barrel plug. This last is one of the few bits that betrays the Grandmother's price point. The cord from the power supply to the barrel plug is slight, and the plug itself doesn't slide all the way into the jack - a bit of the silver shaft remains exposed. It didn't cause any issues and has yet to come loose, but it's too bad that there's no way to secure the cord onto the enclosure to prevent accidental disconnection. That quibble aside, upon receiving the unit, we were pleasantly surprised by the instrument’s heft and build. At 16lbs, it is surprisingly weighty, and the whole thing feels solid. The knobs and pots are of respectable quality, and if the toggle switches are a bit dinky, it's nice that they've been capped. Along with the synth and power supply, the box contains a proper (excellent) printed manual, six patch cables of varying length, and a plastic 'Slinky' toy sporting the Moog logo. You might be glad to have something to play with while waiting for the Grandmother's oscillators to stabilise after switching it on. As with most true analogue synthesizers, it takes ten minutes or so for them to come up to their optimum temperature. Once they do, though, you'll be met with the familiar Moog sound and - depending on the levels in the Mixer module - a little more besides. Why is that? Because while the oscillators are based on the same tried-and-true circuits used in the Minimoog, the Mixer, VCA, Filter, envelope generator, and spring reverb have been designed around circuits used in the classic Moog modules of the 1960s. The Oscillator module is divided between the two main oscillators. Each oscillator can pump out triangle, sawtooth, square, and pulse waves, though any pulse width adjustment must come from a modulation source. Osc 1 offers a selectable range between 32' and 8', while Osc 2 provides ranges between 16' and 2'. Oscillator 2 also offers a knob for independently adjusting its Frequency. Oscillator sync is provided, too. Oscillator Patch points include Wave Out, Pitch In, PWM In (Osc 1), and Linear FM In (Osc 2). By default, the oscillators (and noise) are routed into the Mixer. This is based on Moog's CP3 module, a circuit that provides a lovely asymmetrical clipping when driven hard. In fact, this mixer is often credited with providing much of the famous 'Moog sound'. The Mixer's patch points include Osc 1 In, Osc 2 In, Noise In, and Output. It wouldn't be a Moog without the classic 24dB transistor-ladder filter. It's here (natch) and along with Cutoff, Resonance, and (bi-polar) Envelope Amount knobs, there's a three-position switch for setting up two different key-tracking amounts. Jacks are provided for Input, Output, Envelope Amount In, and Cutoff In. You needn't be told that the filter sounds brilliant - you've heard it before. It is, of course, capable of self-oscillation, and can be played in tune from the keyboard. The lone Envelope generator is a typical four-stage affair; it offers knobs for Attack, Decay, and Release, with a vertical slider for Sustain. The slider's throw is quite smooth - not unlike the crossfader found on a DJ mixer or Elektron's Octatrack. Jacks include Trigger In and both positive and negative outputs. As you'd expect, there's an LFO, hardwired to the mod wheel. Waveforms on offer include Sine, Saw, Ramp, and Square. A knob controls the Rate, and three more determine the amount of modulation sent to oscillator pitch, filter cutoff, or the pulse width of both oscillators. You needn't be told that the filter sounds brilliant - you've heard it before. Modulation patch points include Rate In, Sync In, Wave Out, and S/H (Sample and Hold) Out. This last one is a nice touch, as it can be used alongside the selected LFO waveform. The LFO can be pushed into the audio range and can by played from the keyboard, sequencer/arpeggiator, or over MIDI or via CV inputs. This allows for huge three-oscillator sounds. The Grandmother's VCA provides control over Volume and offers jacks for VCA In, VCA Amount In, and Reverb In. A three-position switch allows the VCA to be controlled by the Envelope generator or set to drone indefinitely. The third option is Keyboard Release mode. This acts as something of a limited envelope generator, with an instantaneous attack, full sustain and a release time determined by the release time of the main ADSR. This doesn't quite make up for the lack of a second envelope generator, but it helps. The Spring Reverb module has caused something of a stir. Once a common feature on synths (VCS3, ARP 2600), Spring Reverbs fell out of fashion when more convincing digital options came along. Yet there is a certain retro charm in the old spring jobs. The Grandmother's spring reverb is small but effective, adding little noise and loads of atmosphere. The Utilities module consists of useful things that are not internally patched. A four-point Mult can merge any four signals. There's also a bipolar Attenuator with a single Input and Output. These might seem a bit ho-hum, but even the simplest function adds power and flexibility in a semi-modular environment. Less utilitarian is the simple (non-resonant) High Pass Filter. You get an input and output - no dedicated patch points for modulation. Nevertheless, it sounds good and can be combined with the low-pass filter to provide band-pass filtering. Layered patches may be created by routing one oscillator through each filter. The Grandmother's Arp/Seq controls occupy the vertical sliver of yellow along the left-hand side. Here, you can switch between the obligatory arpeggiator and a 256-note sequencer. A three-position switch is used to toggle between the arpeggiator, the sequencer, and the sequencer record modes. The arpeggiator is standard stuff - switch it on (using the Play button discussed earlier), hold down a fistful of notes, and the Grandmother will dutifully play them back in the order in which they were played. You can also choose forward/backward or random play. You can elect to play only the notes played, or repeat an octave higher or one octave higher and then two octaves higher. The sequencer mode allows for more complex passages. Up to three sequences may be stored in memory (retained between power cycles). It's strictly a step sequencer - no real time recording - and notes are entered from the keyboard itself. Rests, ties, and accents are entered using the three buttons above the pitch and mode wheels. Recorded sequences can be latched and transposed on the fly by pressing any key. The toggle switch used for selecting the arpeggiator's octave is also used to select which of the three stored sequences is played. We've mentioned the Left Hand Controller buttons a number of times, as they perform quite a lot of functions, including many less-than-obvious tasks. They are, for instance, used in conjunction with the keyboard for global chores like changing the instrument's MIDI channel, adjusting MIDI clock behaviour and pitchbend range, activating local on/off, and much more. Most are described in the manual, so you'll want to keep it handy. At least one undocumented function turned out to be crucial. When we first fired up the Grandmother, something felt amiss. We very quickly discovered that the master tuning was a full 133 cents off. We attempted to adjust the Fine Tune knob around back, but to no avail - its range was strangely limited. An email to Moog resulted in a hidden 'Note Calibration' procedure, accessed by holding down a couple of buttons and playing the lowest note on the keyboard. Quite a few minutes transpired before the process was completed. Still closer inspection revealed that our pitch and mod wheels were not behaving as expected. Another quick email exchange with Moog provided that answer, too. A very few units were arriving with knobs and wheels out of calibration. The Grandmother's calibration data is stored in an internal EPROM. Moog sent us three tiny SYSEX files and instructions to rectify the problem. It was a simple process and worked just as they promised. The pitch and mod wheels now did what they were supposed to do, and the Fine Tune range was extended to a reasonable and useful range. Most importantly, the instrument was perfectly in tune, and we've not had an issue since. Despite a diminutive stature, this Grandmother is a versatile performer, capable of a vast range of sounds even before patching a cable. The default signal path provides enough flexibility to whip up suitably thick, thumping basses, snappy kick drums, sweeping leads and even a few interesting sound effects. Somewhat reminiscent of early ‘80s monosynths like the Roland SH-101 and Moog Source, there's plenty to explore and the resulting sound is satisfying, even encouraging. Moog's legendary sonic character is such that the raw waveforms sound good even with very little modulation or manipulation, and this is the case here, too. Once the patch cables come out, many of the instrument's limitations fall away. Only a few cables are provided, but it doesn't take many to whip up some exciting patches. Burbling effects, ever-changing drones, and percolating ambiences are easily achieved. The instrument's many sync options allow for syncopated passages using both sequencer and LFO in lock step. Using it in this way, we were able to fake a delay line for some convincing Berlin School sequencery. The addition of the spring reverb is icing on a very tasty cake. Despite a diminutive stature, this Grandmother is a versatile performer, capable of a vast range of sounds even before patching a cable. It's worth noting, too, that the comprehensive I/O options facilitate extending the instrument's feature set with external modular or semi-modular gear. For instance, looping in an additional envelope generator is simplicity itself. Its sequencer and arpeggiator will happily play with other MIDI and CV-based sequencers, and can even be locked to an audio click. If the current six-week waiting period between placing an order and receiving the instrument is any indication, Moogs has a hot seller on its hands. The Grandmother ticks a lot of boxes. It's an ideal instrument on which to learn the basics of synthesis and beyond, and an excellent gateway into the world of modular and semi-modular synthesisers. For those who just want to play, the high-quality keyboard and chunky panel controls make it an enticing gigging companion. The Grandmother isn't for everyone. There are no presets or polyphony, it offers a meagre sequencer memory, and a limited physical key range. It's not designed to be the ultimate all-in-one solution (though it would pair well with such an instrument). Here, the limitations are intentional and can be viewed as an asset. Is it worth the asking price? Absolutely, if for no other reason than providing users with a taste of those old Moog modular circuits without having to take out a second mortgage. If you pieced together a similar collection of cloned Moog modules, you'd pay more, and you'd still have to pony up for a high quality keyboard. Here, you get the goods from Moog itself, and many other features besides. Whether you’re a beginner to the world of synthesis or an old hand looking for a taste of that vintage Moog sound, you'll find that this Grandmother is a mighty maternal mite, and one with whom you won't mind spending some quality time.